As part of my Athol’s always-generous birthday package, I got tickets to my favorite band, TRAIN. 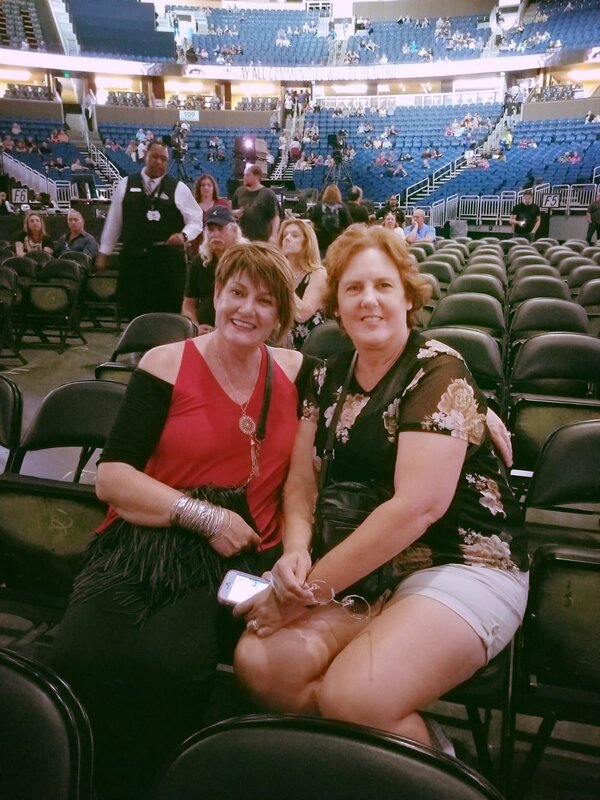 My concert-bud, Tammi and I, sped off to Orlando with rock n’ roll on our minds and “Marry Me” on our lips. We feasted at Mark Walberg’s hamburger joint, drank beer shandies while listening to the Church Street band. We felt young, carefree, silly and excited. Then I realized Hall & Oats were billed alone when Tammi and I saw PINK just a few months ago. I bet TRAIN, without a planned tour for 2018, were pulled in last minute. They should’ve just asked me. I knew who would draw the passengers. Hall & Oates? In my South African youth, we had a limited H&O fare. Most of our music was British, though it was Rodriguez who was the American-most-close-danced to; most-kissed-to. Hell, Rodriquez was the most American-American we knew in the deep, untamed part of Southern Africa. I had no idea that Aerosmith existed until I came to my new country and heard Steven Tyler. I felt a 30-year long deprivation. Hall and Oats owned but a soft slither of my LOUD South African seventies. It was dominated by Deep Purple and Uriah Heap and Dire Straits and The Who and Humble Pie and Led Zeppelin. But then came Patrick Monahan and TRAIN. Needless to say, poor Pat would be squashed into oblivion with my cash and prizes! He’s shrunk and I have grown since we radio-met. Oh well, proof that music transports one to unrealistic places. And that’s ok! It’s legal and I doubt enigmatic singer-songwriter crushes are deadly-sin-eligible. The music that night pounded through the floor, up my legs, into my to stomach and up, up, up into my throat and my ears and my eyes and until my head was filled with a thudding rhythm. My teenage soul soared as my body moved all on its own and I sang my heart out and I cried for Patrick’s lost mother and for my joy at being alive. Just as well there was an intermission to get the old pounding heart back into place because when Hall & Oats strolled out, there was no cause for thumping organs. I had to adjust. They were so laid back and so hippy and into their own music. But in a few minutes I felt myself slipping into a world my Athol taught me to listen for: the sound of individual instruments. So I got in the groove and heard each note and I was consumed by the beauty of music. All music. TRAIN will be on my platform till Patrick is a raisin and I am a blimp. Just sayin’!